Prominent & Leading Wholesale Trader from Mumbai, we offer digital manometer, voltage current multimeter, multimeter, digital multimeter and kew 1009 digital lcd display multimeter. 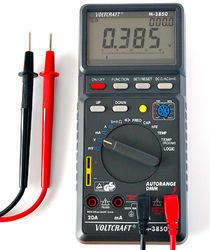 Backed by our efficient workforce, we are capable of manufacturing and supplying Voltage Current Multimeter. All the products designed and manufactured using quality components and material to ensure that final output meets with international quality standards. Moreover, we deliver all our offered products at customers’ end within the promised time frame. 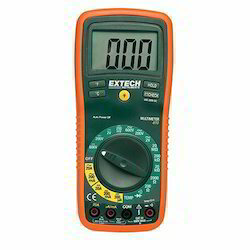 We are engaged in providing a wide range of Multimeter. These are used in a variety of Institutes and Laboratories to measure the length of small objects. 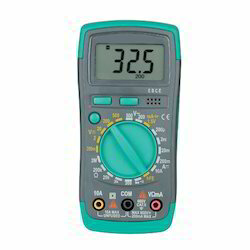 Our range of multimeters are sourced from reliable vendors who check these meters on various norms. Owing to these special features, they are extensively demanded by our varied customers. 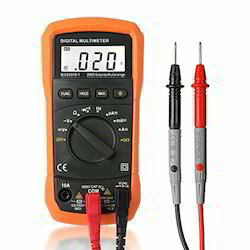 We are engaged in supplying a wide range of Digital Multimeter to our esteemed clients. In order to meet the set quality standards, the offered range is designed by our vendor using the best quality components and sophisticated technology as per the set industry norms. Furthermore, the offered range is tested on various parameters of quality in order to deliver flawless range at clients’ end. • Display : 4000 counts. Auto range and manual range selector provided. • (with range hold feature) Resistance range provides audible continuity test. • Automatically turns power off in about 30 minutes to conserve battery life.Direct current measurement up to 10A AC and DC.With Holster. 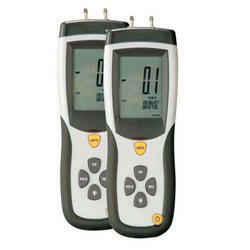 Looking for Lab Multimeter And Manometer ?